Missoula is a western destination city that sits smack dab in the middle of top-shelf trout country. The blue ribbon Clark Fork, Bitterroot and Blackfoot Rivers are all nearby and offer fantastic options for the traveling angler. 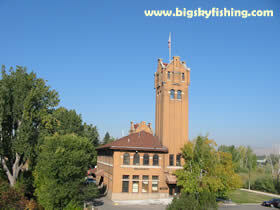 Montana Fishing Outfitters offers guided fishing trips and fishing/lodging packages in and near Missoula. Outfitter #17209. Missoula is the state’s fastest growing city. Sitting in the scenic Bitterroot Valley, Missoula has for many years attracted people from out of state who want to settle in Montana, but lack the desire to live out in the middle of nowhere. And for these people, Missoula fits the bill perfectly. Missoula, as far as Montana cities go, has pretty much everything a person could want. This is partially due to the mass influx of tourists that pass through Missoula during the summer. But it is also due to the presence of the largest college in Montana, the University of Montana, which swells the Missoula population by more than 20,000 people during the academic year – many of whom also hang around Missoula during the summer. Overall, Missoula’s population is around 67,000. The surrounding area pushes the population over 100,000 - making Missoula the second largest "metropolitan" area in Montana. As the fastest growing city in Montana, Missoula has, of course, a number of problems that go with it. Missoula has the dubious honor of being the only place in Montana that really has any sort of air pollution problems that are manmade, particularly during the winter (smoke from forest fires can plague anyplace in Montana during fire season). The traffic in and around Missoula can also be, quite simply, a nightmare, although the rebuilding of US 93 south of Missoula has alleviated this problem somewhat. 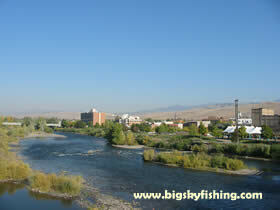 Missoula is located in the southwest corner of Montana, near the border with Idaho. The massive Frank Church-Selway Bitterroot Wilderness Complex sits to the west of Missoula, while the Sapphire Mountains rise to the east of town. The Rattlesnake Wilderness Area, a small wilderness area, also sits just a handful of miles to the north of Missoula. And, outside of the wilderness areas, are miles and miles of the Bitterroot National Forest. Interstate 90 runs along the northern edge of the city. Since Missoula is the last major town of any consequence for many miles for people traveling west, Missoula receives many visitors who just spend the night in Missoula before moving on. Missoula lies in a beautiful valley called the Bitterroot Valley. This big, sprawling valley is surrounded by towering mountains to the east and west, with smaller mountains visible to the north and south as well. Due to this scenic location, and the huge amount of recreational activities the valley and mountains provide, it is probably not surprising that people from all over the United States are moving here. For people visiting Missoula for the first time, try to make a point of finding and visiting the downtown. Missoula, like all too many towns these days, is about 70% strip mall and development, while the remaining downtown is tucked away and easily missed. Once you break away from the strip malls and such and enter the downtown, tree-lined streets and a very nicely refurbished will greet visitors downtown – with numerous specialty shops and restuarants. The Clark Fork, which runs right through downtown, also provides a nice backdrop for downtown Missoula. Montana probably doesn’t have the worlds nicest weather. However, as far as Montana weather goes, Missoula is a wonderful place to go for people who hate the cold. Missoula lies quite the distance from the continental divide. As such, it isn’t very often that the true, cold, arctic air that blasts the eastern and central part of Montana actually reaches Missoula (the mountains block the cold air). For this reason, Missoula really is the “banana belt” of Montana. The other side to that, though, is Missoula – like Kalispell – has many gray, rather dreary days during the fall, winter and spring. Clouds build up in and around the mountains and, at times, hang around for weeks – with the sun hardly making an appearance at all. The clouds – while they help keep the winter nights warmer than they otherwise would be – also can wear on the nerves of people who are use to sunshine. The city of Missoula also doesn’t get much in the way of snow, at least by Montana standards. Typically, Missoula receives less than 50 inches of snow a year. A fair amount to be sure, but not nearly the amount received in other areas of Montana. Moreover, the warmer weather in Missoula frequently prevents the snow (at least down in the Bitterroot Valley and in town itself), from hanging around all winter. Of course, this all changes when heading into the mountains, where the snow piles up and sticks around for eight months of the year – but that’s another story.